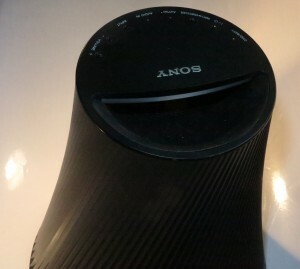 Previously I have reviewed the Sony SA-NS410 wireless speaker as an example of one of Sony’s new wireless speakers. This time, I am reviewing the Sony SA-NS510 portable wirelesss speaker which a larger speaker in this series, that has the ability to work for five hours on its own battery as well as working on AC power. The Sony SA-NS510 portable wireless speaker is in the form of a tapered tube which is able to yield an efficient sound output without much amplifier power. 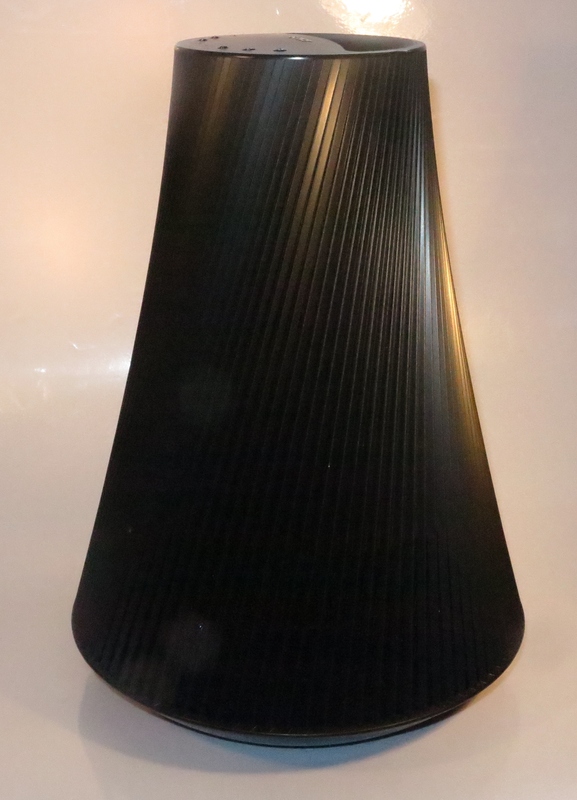 At the top of this tube, where the controls for the power, volume and “Party Streaming” mode are, there is a port which doubles as the speaker’s carrying handle. This port is part of the acoustic design for the speaker and is lit up in blue when the speaker is ready to use and in white while it is playing. I needed to reset this speaker using the ALL-RESET button before enrolling it with the home network. This speaker, like the rest of the NS series of wireless speakers could benefit from an “easier-to-implement” first-time-setup mode like the OPERATE switch (which turns the power on an off fully) having a “SETUP” momentary position. The speaker is easy to carry with one hand using the abovementioned port where there is a hand-grip, and runs on a rechargeable battery as well as AC power. When it is on battery, the “CHARGE / BATT” light glows green whereas it glows red while charging from the external power. This light is off when you run this speaker from external power so as you know it is using that power rather than the battery. Having the power, volume and other controls on the top of the speaker makes it easier to operate these essential functions without looking for hard-to-read buttons on a bottom edge or a remote control if you needed to “drop the volume” to make a phone call. 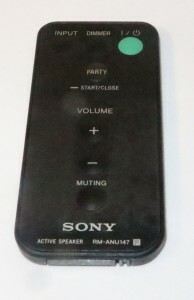 Yet there is the remote control which is the same as the one that comes with the SA-NS410 speaker. As for the sound, there is that punchy tight bass with the clear sound from vocals and other higher frequencies. I have taken this speaker to higher levels without it sounding muddled or confused due to clipping and it can provide that room-filling sound for a small room. 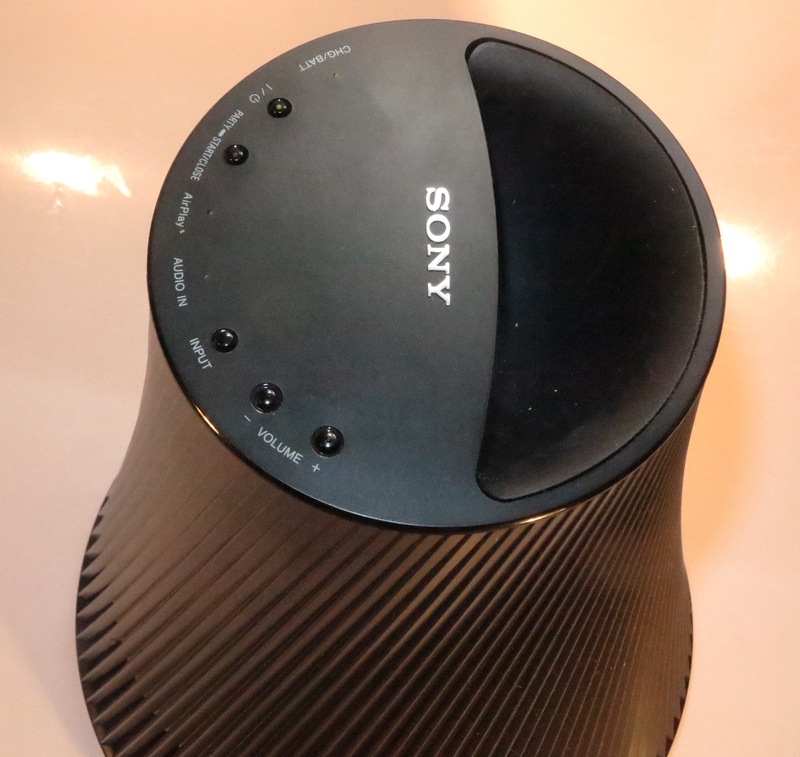 The Sony SA-NS510 had very good network prowess for a wireless speaker. It could pick up well for a speaker positioned at the other end of the house thus performing as expected with the Wi-Fi network. There wasn’t any issues with streaming content from the network sources and the Internet-radio sources. Even the ability to be “discovered” with Airplay worked well when a teenager who lived with us was trying out that function on his iPhone and the music came through promptly on the speaker. 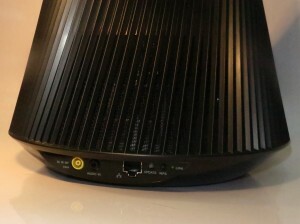 Like the SA-NS410 stablemate, it presented the streaming-media sources as two empty folders to other DLNA media devices but wouldn’t list out the Internet radio stations or similar resources. 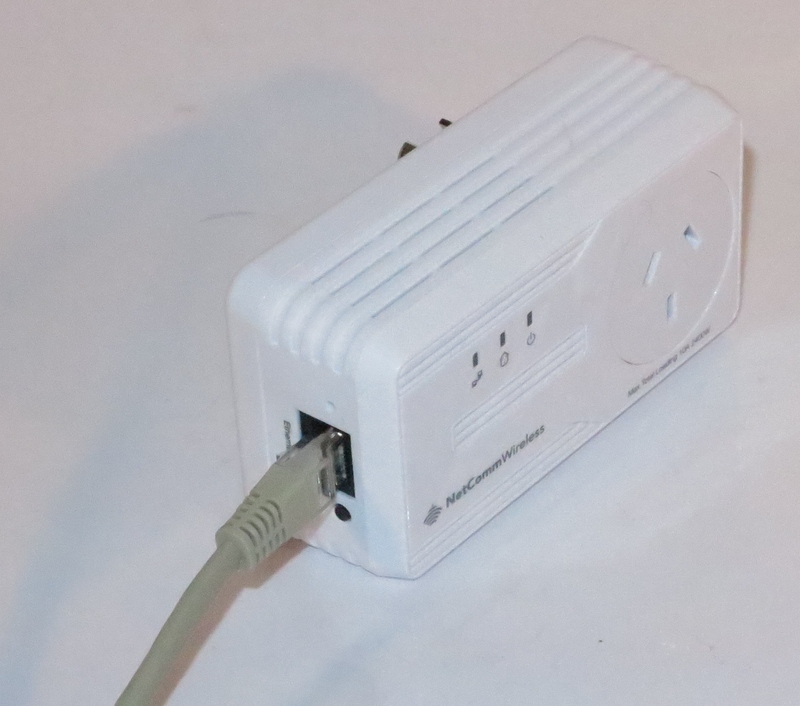 Of course, there is the ability to connect this speaker to a wired (Ethernet or HomePlug AV) network segment via the Ethernet socket. This is alongside the ability to have this speaker playing from a Walkman, Discman or iPod full of tunes via the 3.5mm input jack. The Party Streaming function does perform although it was a bit glitchy at times. This was with this speaker picking up the DLNA content from my phone and the SA-NS410 acting as a guest role. This can be a problem as the Sony speakers keep a best effort to satisfy the network-wide broadcast requirements for Party Streaming across the Wi-Fi segment. The Sony SA-NS510 could benefit from simple access to a “new-network-setup” mode so you can get going with enrolling it with that wireless network. Other improvements I would like to see regarding network setup for these speakers is the ability to remember two or four wireless-network parameters as well as a Wi-Fi Direct / own-access-point mode. The former feature could work when you do things like use them with a “Mi-Fi” mobile router or a wireless range extender or temporarily at another person’s house; whereas the latter feature could come in handy if the speaker is used alone with a smartphone or tablet. As well the “Network Audio Remote” Android smartphone software could benefit from a bit more work. For example, it could be quick about reflecting new status changes with the speakers or showing the latest changes as they occur such as when you adjust the volume using the controls on the speaker or “push” a new song to the speaker using another DLNA controller program. I went through the instructions for this speaker and it talked of the time to replace the battery in this speaker was something to be done at the end of the speaker’s useful life. But I would like to see this being allowable if the battery started to lose its charge over the years of use, something that can happen if you use the speaker on an occasional basis. Here, I would like to see the battery available as a spare easily-replaceable accessory that can extend the speaker’s useful life. I would specify the Sony SA-NS510 Portable Wireless Speaker as being suitable for applications where portability is to be important. This includes situations where you expect that the speaker could be used near wet areas such as to play music to accompany a pool party or serenade a long bath because of the fact that you are not supplying it with AC power to have it in operation. If you intend to use this speaker “on the road”, the five-hour battery runtime may be a bit short for this application. 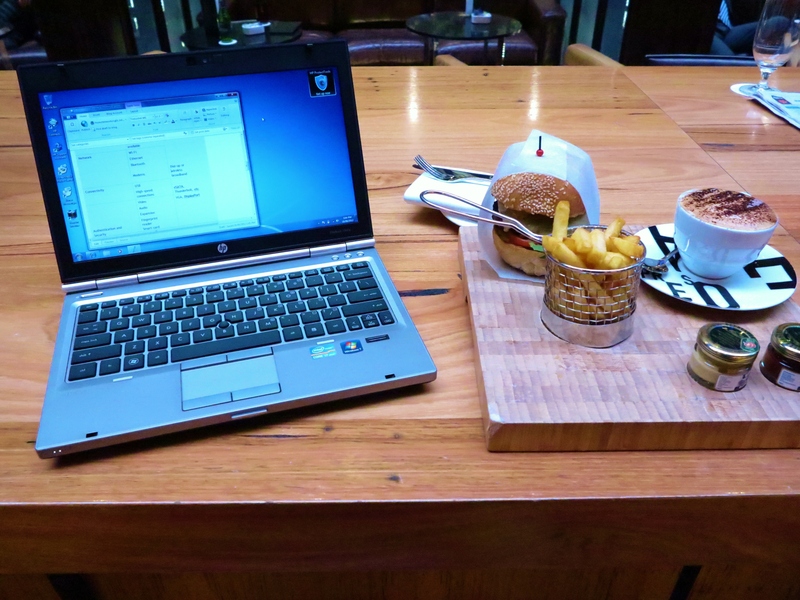 As well, you would have to use it alongside a MiFi device if you are away from a home network or similar small network.